Are you a teacher, youth worker, or early-learning educator? Then register now to take part in RSW! 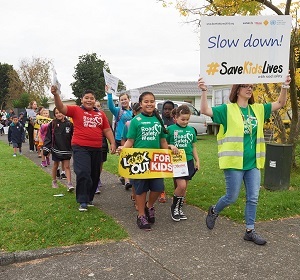 All kids and young people use roads and have experienced road danger; so it's the perfect topic for a project that can really engage them as well as save their lives, while also meeting curriculum goals. 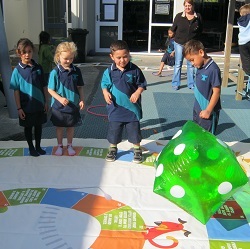 Road Safety Week is a great time to tie your activities into a national event, and kick-start campaigns in your area. 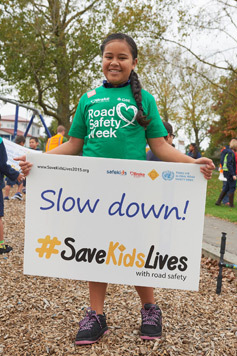 So help stop the carnage by signing up to run a road safety project in Road Safety Week, and we'll stay in touch with you along the way, helping you to run a great event. Read our ideas below to get you started, then register to get our e-bulletins full of tips, ideas and downloadable resources to use during the Week! Sign up for a free electronic action pack full of downloadable resources and activity ideas. In addition to the electronic action pack, you can order low-cost hard copy resources for your activities. Access some of our free resources from Road Safety Week 2018. Age 2-7 - children can #SpeakUp to parents about the importance of child seats, holding hands near roads and wearing a helmet when using a bicycle/scooter. #SpeakUp to drivers in your community about slowing down around your childcare centre. The Road Safety Week and Beep Beep! Day action packs have various resources to help you share these messages. Age 5-13 - run a #SpeakUp activity. Students could design placards to remind drivers in the community to slow down and put the phone away to help keep children safe. You could organise a #SpeakUp debate for students to discuss what road safety issues are important in your community. Age 11+ - students can #SpeakUp to peers about road safety, for example on walking/cycling safety, being a safe passenger in a vehicle, and for older age groups, safe driving behaviour. #SpeakUp about road safety issues in your area and engage the local council. Run a Beep Beep! Day, teaching children key road safety messages and engaging parents too. Talk about road safety, read a road safety story or sing a road safety song. Teach that traffic is dangerous and holding hands is important. Make a road safety display using free posters from Brake. Register today to receive those resources. Mention Road Safety Week and promote road safety in your newsletter to parents. Send a flyer or newsletter to parents about road safety. Fundraise for Brake on your Beep Beep! Day or by running a Bright Day for Brake and help us to continue providing free support resources to bereaved families. Talk about road safety in your assemblies or hold a special road safety assembly or open event for parents. Use our hands-up survey for 5-11 year olds to get students' opinions on road safety in your area and use the results to devise some activities for the Week. Integrate road safety learning into curriculum lessons, e.g. drama, geography. For more information on bringing road safety into the classroom visit our Teacher Zone. You can also use NZTA's education resources. Make a road safety display in your school/centre using free posters from Brake. Register today to receive those resources. Talk to your local council's road safety coordinator or community Police about road safety and any activities happening in your local area. Mention Road Safety Week / promote road safety in your newsletter to parents. Send a special flyer/newsletter to parents about road safety. Challenge the children to create a road safety poster/leaflet/banner/film/play. Organise a media photo call. Find out from your local council the number of people killed and injured on your region's roads last year. Arrange for that number of people to lie down in the shape of that number somewhere safe (e.g. a school playground). Run a local campaign to make improvements to the safety of a road in your area. Arrange a media spokesperson. Talk in advance to local officials, so they know what you are doing and you can ask them for any necessary safety advice. Read our community campaign guide. Have a special guest in to talk about road safety, for example, a police officer, or drama group. Fundraise by running a Bright Day for Brake (when everyone turns up wearing something bright in return for a donation!) to help us continue to provide free support resources for bereaved families. Fundraise for Brake in another way. View a range of fundraising ideas. Challenge the young people to create a road safety poster/leaflet/banner/film/play. Don't forget to register to tell us what you're planning so we can feature your activities.